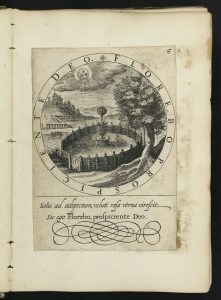 The emblem book is an expansive genre of literature which experienced its highest level of popularity from the fifteenth to early eighteenth centuries. These books, whether they contain emblems on religion, politics, love, or natural history, combine image and text to teach the reader a moral message. Emblem LII from Cats, Spiegel van den ouden ende nieuvven tijdt (1632), p. 158., shelfmark OTM: O 62-8081. This message is not intended to be discovered at first glance; authors often include multiple languages and puns in order to playfully hide the answer from plain sight. Thus, the reader is challenged to discover the meaning of the emblem in a way that is entertaining and memorable. The text often takes the form of a title, or motto, followed by a longer explanation or poem known as the subscription. The image, or pictura, may incorporate figures, scenes, plants, or animals from classical and medieval myths, or even contemporary times. 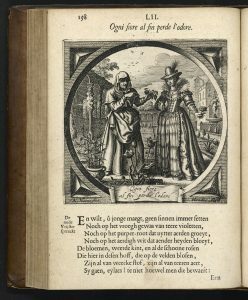 Figure 1 shows an emblem from Jacob Cats’ Spiegel van den ouden ende nieuvven tijdt (1632). 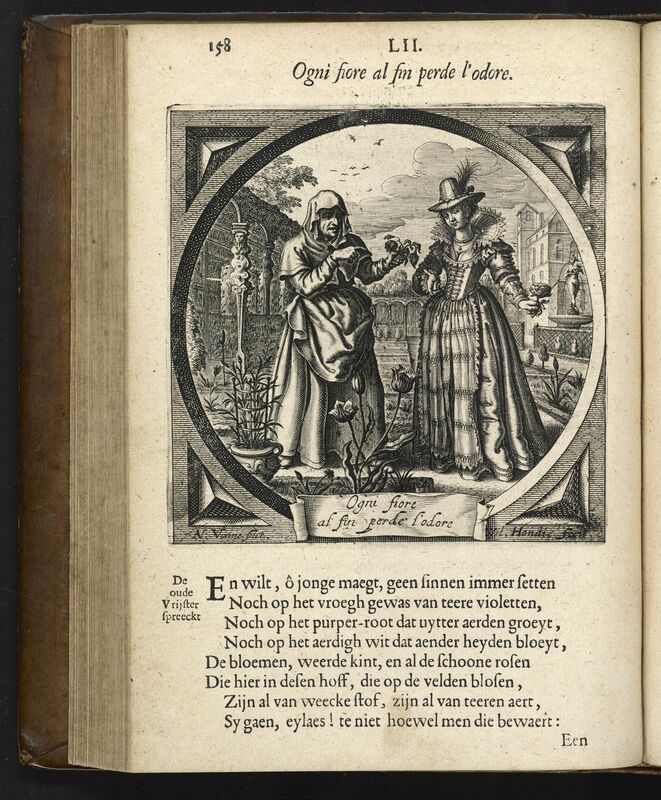 The motto, “Every flower eventually loses its scent”, accompanies an image of an old woman warning a young woman that she will someday share the same fate. There is a subsequent poem along with references to classical authors, emblem writers, and biblical passages. As the most popular and influential emblem writer, Cats’ emblematic style was emulated by many others. 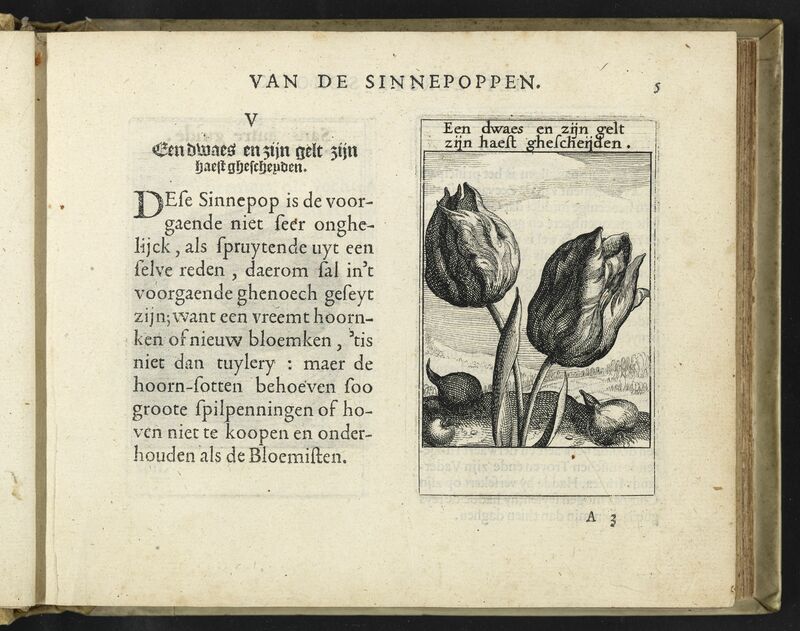 Among the multitude of emblematic motifs, what is it that makes the study of flowers in Dutch emblems so interesting? The Dutch have been known for their love of flowers for centuries. This fascination with flowers is reflected in Dutch art and literature. 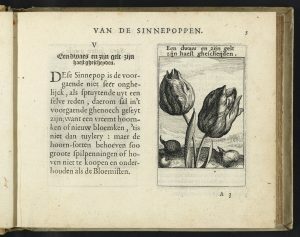 The popularity of floral motifs in emblems, as well as other art forms, allows researchers a variety of academic approaches to better understand the history of Dutch art. It is possible to follow a particular flower motif as the century progresses, thus adding to the discourse on how emblems change over time. Additionally, the study of such emblems offers a glimpse into seventeenth-century Dutch culture. For example, emblem books can help reveal contemporary views on the fascination with natural history and the collection of exotica. Figure 2 shows an emblem from Roemer Visscher’s 1614 edition of Sinnepoppen, one of the most popular emblem books of the era, with the iconic motto: “A fool and his money are soon parted”. Visscher was certainly a critic of the Dutch’s preoccupation with collecting rare and expensive natural objects. Indeed, in large part due to emblem books, present day readers are able to discover which values and morals authors wanted to teach readers. The ultimate sources for living a moral life were the Bible and the early Church Fathers. Figure 3 shows an emblem from Gabriel Rollenhagius’ Emblemata volsinnighe uytbeelsels (1615). Here, flowers (the rose specifically) symbolically refer to the proper conduct of the faithful Christian; as the rose follows the light of the sun, men are to follow the light of God to direct their lives. The three examples given only scratch the surface of the wide subject of floral symbolism in emblem books. During my research, I have found a multitude of flowers, including roses, lilies, chrysanthemums, violets, and tulips, to name but a few. If you are interested in seeing any of the publications here, do not hesitate to consult them in the reading room of Allard Pierson. Figure 2. Emblem V from Visscher, Sinnepoppen (1614), p. 5., shelfmark OTM: OK 62-9148. Emblem 6 from Rollenhagius, Emblemata volsinnighe uytbeelsels (1615), p. 6., shelfmark OTM: O 02-7. The English translation of the subscriptio is as follows: “Like a rose in spring thrives under the face of the sun, so shall I bloom when God foresees me”. 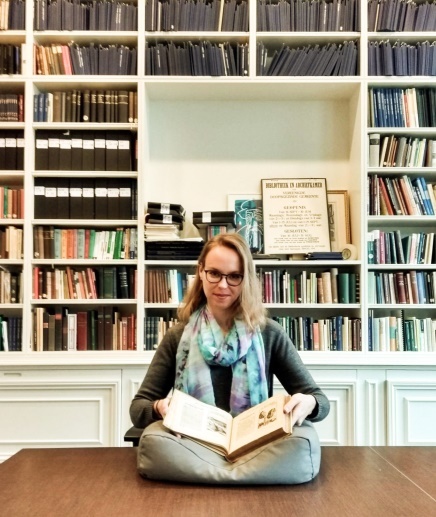 Since September 2018, I have been conducting a research internship with the Allard Pierson of the University of Amsterdam in which I collected all images of flowers in seventeenth-century Dutch emblem books listed in the Short Title Catalogue Netherlands (STCN) . I recorded all of these images and titles in a Google Document. Additionally, I created a document which includes images of flowers in all engraved title pages and illustrations of theological books of the same period. At this point, my research has not included ornaments, stylized initials, or printer’s devices. This will, however, be a significant area of future research as flowers appear abundantly in these elements. Compiled and published by the Royal Library, the STCN is the leading collection of Dutch publications for the period 1540-1800. Titles found on the STCN were consulted digitally with Google Books and/or within the Allard Pierson. 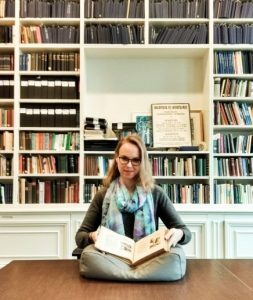 This post is intended to showcase some of the interesting examples I found, all of which can be consulted in the reading room of the Allard Pierson.